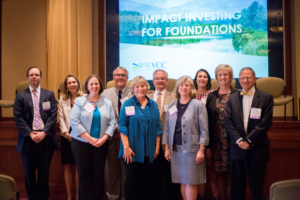 Virginia Community Capital (VCC) hosted over 60 attendees from across the Commonwealth at Lewis Ginter Botanical Garden on the evening of September 20th for a panel discussion on the status of impact investing with foundations. Panelists included Mary Fant Donnan and Dr. Michele Ballou from The Allegany Foundation, Jessica Wirgau and CJ Carter from The New River Valley Community Foundation, Michelle Nelson and John Kemper from The Community Foundation Serving Richmond and Central Virginia, and Mark Constantine and Bobby Thalhimer from The Richmond Memorial Health Foundation. These board and staff pairs spoke about being early adopters of impact investing, and how it has enhanced their philanthropic portfolio and overall mission work as a foundation. 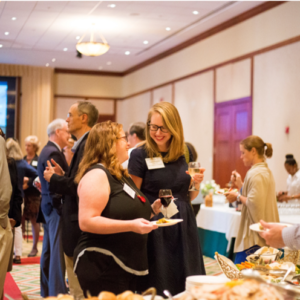 Here are photos from event hosted by Virginia Community Capital, a founding member of the Virginia Impact Investing Forum (VIIF). 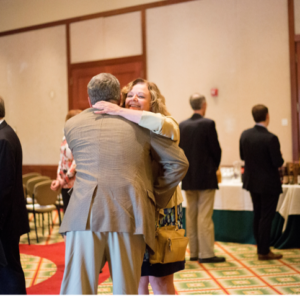 Virginia Impact Investing Forum is a consortium of leaders from the academic, business, government, non-profit and foundation sectors dedicated to building the knowledge, profile and practice of impact investing in Virginia. CDFIs, or Community Development Financial Institutions, are dedicated to delivering responsible, affordable lending to help low-income, low-wealth, and other disadvantaged people to join the economic mainstream. VCC is a CDFI, which was established in 2006 with an initial $15 million investment under Governor Mark R. Warner, and has leveraged that to over $1 billion in total project impact. Investments with VCC are used to create opportunity in underserved areas of the Commonwealth, supporting job creation, affordable housing options, energy efficiency, healthy food access, and community revitalization. Join the movement, and make an impact with your investments. Let’s do more together.